UPDATE: May 25th: 9am CST: Greenpeace activists have ended their 26-hour occupation of the Fisk Generation Station smokestack in Chicago, leaving behind a giant reminder of the Windy City's dirty legacy and clean energy future: The painted letters of "Quit Coal" now drape permanently down the sides of the smokestack with the demand that California-based Edison International close down its deadly Fisk and Crawford coal plants. Nearly a century ago, Chicago activist Mary "Mother" Jones took on the great coal barons of her city. Jones declared: "Not all the coal that is dug warms the world. It remains indifferent to the lives of those who risk their life and health down in the blackness of the earth." Until Chicago passes the Clean Power Ordinance, that deadly legacy remains for the children and citizens under the volcano of the nation's most decrepit coal-fired plants. Greenpeace's daring actions against Chicago's lethal and widely denounced old coal-fired plants expanded this afternoon, as eight more activists rappelled off the Pulaski Bridge, near the Crawford coal plant in the neighborhood of Little Village and dropped a banner that blocked coal barge traffic on the river. The banner declared: "We can stop coal" and "Nosotros podemos parar el carbόn." 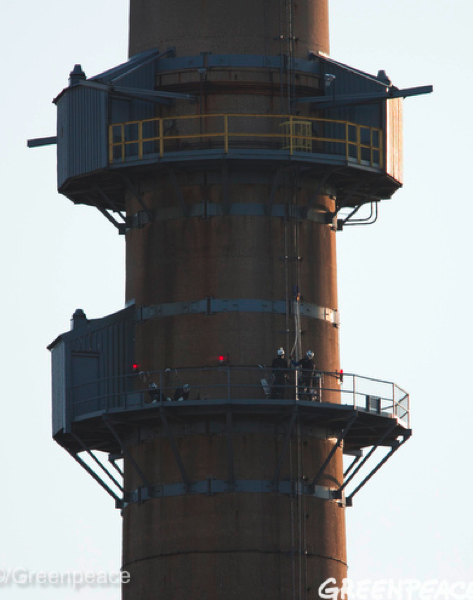 Meanwhile, at the Fisk Generation Station, eight other Greenpeace activists scaled the 450-foot smokestack in the ailing Pilsen neighborhood this morning. Citing the spiraling and devastating impact of the decrepit coal-fired plant on the area citizens and the city at large, the protesters are calling on the Edison International subsidiary Midwest Generation and the city of Chicago to "quit coal" and shut down the plant. "I know that we can stand up to big coal and use our collective power and strength to stop companies like Edison International from poisoning our communities. All around America, people like us can stop coal. We must take a stand for our health, our welfare and our future," said Laila Williams, one of the activists dangling from the bridge. Ian Viteri, a resident of the Little Village community affected by the Crawford plant said, "Communities like Little Village are being hit the hardest by pollution from coal plants, and enough is enough. 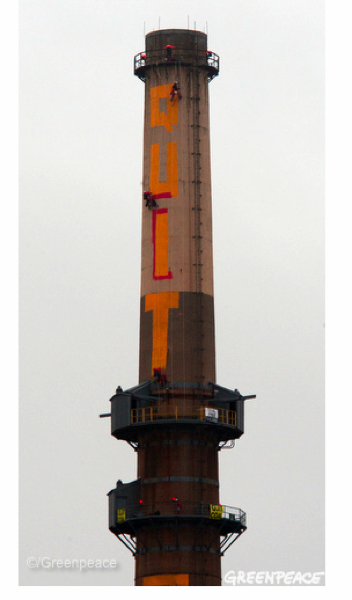 In a true testament to civic duty and responsibility, the Greenpeace activists atop the Fisk Generation Station are now cleaning up the filth and toxic particulates along the 450-foot tall smokestack with a new coat of paint -- and a special message for the city of Chicago, Mayor Emanuel, and the Irvine, California-based multinational corporate owners Edison International. "As a Chicago resident, I know that we must shut this plant down -- to make our air cleaner, our communities safer, and to stop the effects of global warming. All across America, companies like Edison International are poisoning communities with their coal plants -- and people like us are fighting to have those communities voices heard. We're going to stay up here until Edison International hears our message," said Kelly Mitchell, one of the activists who climbed Fisk's stack. Numerous studies have documented the link between Chicago's two coal-fired plants and lung cancer, heart attacks, premature deaths, acute and chronic bronchitis, emergency room visits, and record asthma rates and other respiratory illnesses, which cost the city an estimated $127 million annually in damages. According to a released statement by Greenpeace, "Fisk and Crawford generate about 18 times the emissions of O'Hare airport's ground operations and equal two-thirds of the CO2 emissions generated by all modes of transportation in Chicago." "We're fighting for our lives," said Leila Mendez, a resident of the Pilsen community. "This plant has a significant impact on the health of our communities and our children. These plants don't power Chicago; the profits go out of state, and we get stuck with the pollution. It's time to stand up to Edison International and demand more for our future." Earlier this spring, the Chicago City Council failed to vote on the Chicago Clean Power Ordinance, which would have forced the plants to clean up or shut down. A national coalition has focused on Chicago's dirty plants as ground zero for clean energy transition in the nation. "Chicago is facing a serious challenge," says Chicago-based community activist Edyta Sitko. 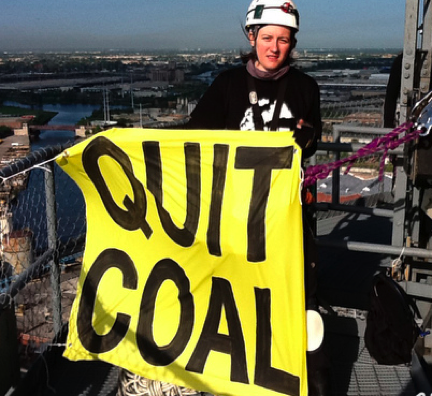 "Will the Council lead the country by quitting coal and standing up to corporate polluters? Or will it be the last major American city with two dirty coal plants within its borders? " In 1892, an editorial in the Chicago Tribune opined: "Doubtless the end of the coal, at least as an article of a mighty commerce, will arrive within a period brief in comparison with the ages of human existence... How long can the earth sustain life?" Over one century later, citizens across Chicago and the nation are now demanding that Midwest Generation and Chicago's new mayor Rahm Emanuel finally make good on this promise and transition the city to clean energy.